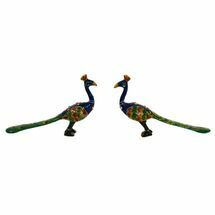 Decorate your home living area with these beautiful handpainted Rajasthani meenakari work Cow Pair. 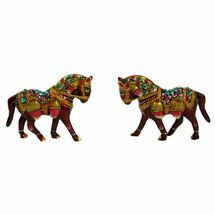 Set of two beautifully painted Cow statues, which adds color and vibrance to the decor of your home. In this statue, the face of cow is turned on her left side. 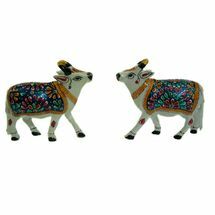 These Cow statues are made of metal so no fear of breaking. The painting work is done very nicely and will not be faded over the time. 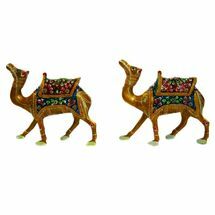 These are easy to maintain with their original color with no fear of metal being oxidized as it can happen in non-painted metal. 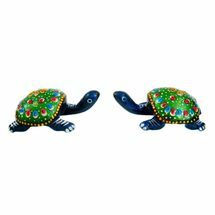 Decorate your home living area with these beautiful handpainted Rajasthani meenakari work Cow Pair. 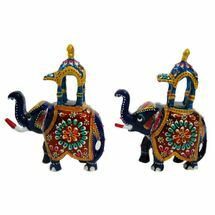 Set of two beautifully painted Cow statues, which adds color and vibrance to the decor of your home. In this statue, the face of cow is turned on her left side. 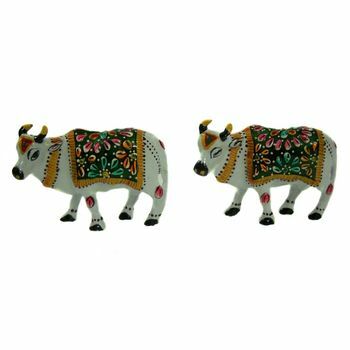 These Cow statues are made of metal so no fear of breaking. The painting work is done very nicely and will not be faded over the time. 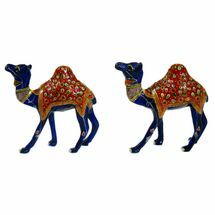 These are easy to maintain with their original color with no fear of metal being oxidized as it can happen in non-painted metal. We believe in "What You See Is What You Get" policy and selling 100% genuine products. 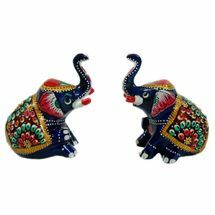 But as these are handicrafts products, there may be slight 5% variations in design / color / size of the actual products you receive as compare to what we have listed here.